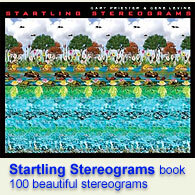 Custom Stereograms : Stereogram Images, Games, Video and Software. All Free! Need a custom made stereogram for you special project? We can design a stereogram with hidden 3D image of your choice. Well known Publishers, Product manufacturers and Advertisement agencies have been using Stereograms for decades, since this amazing 3D art became popular. If you need a quote for a custom made stereogram, just fill out the form below. It's simple and there is no obligation to order. Stereogram of Your Logo for promotions and ads. Though some people won't be able to see the hidden image, the other who can will pay more attention to a stereogram than to a regular 2D ad. 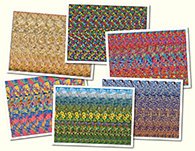 Custom made Stereogram Artwork for corporate products like mouse pads, notebooks, restaurant's food trays. Ad with a hidden promotion code or message. Puzzles for magazines and websites. Stereogram posters for malls and online shops. Custom made stereogram illustrations for your book. Stereogram of your merchandise as a hidden 3D image. Custom design with hidden picture for t-shirts, mousepads, cutting boards and virtually any product with a flat surface. Custom made poster as a great gift for you friend or loved one. Stereogram with provocative picture or message will be a cool party amusement. Holiday Postcards with hidden person's name in it. It will be a very unusual and special gift.